What horrors must ISIS commit before the world will stop the murderers? Aleppo, the largest city in Syria, is its economic hub and once had the largest number of Christians. After war broke out in 2011, the city quickly became divided between government forces and rebel factions. Today much of it lies in ruins, including many of its ancient churches. At the moment, all sides are gearing up for another major battle. The never-ending violence is destroying the country's Christian heritage, says the Melkite Archbishop of Aleppo in this speech. In my country Syria, Christians are caught in the middle of a civil war and they are enduring the rage of an extremist jihad. And it is unjust for the West to ignore the persecutions these Christian communities are experiencing. Syrian Christians are in grave danger; we may disappear soon. We hope that men and women of good will, in this great nation, listen to our call and give their brothers and sisters in faith a helpful hand in relieving their miseries. For the past four years there has been much talk about the war in Syria. We have heard about the strategic consequences, the geopolitical influences in that region, and the violence afflicting the innocent population. Though I do not underestimate the political stakes of what is going on in my country, I must draw attention to the fate of Christians who are caught in this turbulence. For the Church, what is most important is that peace be restored! And that, through peace, a non-confessional and pluralistic democracy is established, that guarantees all Syrians their God-given rights to live as fully fledged citizens in the country where they were born and where their ancestors are buried. The realities in my country and in the region are complex and interwoven with many historical, social and religious nuances. Let me touch on one of the core problems which torment Christians and their pastors in Syria. Some are wondering how it is that religious leaders and bishops were not the first ones to support the rebels, who, apparently, are fighting for freedom and democracy for their country? If this were the case, it is undeniable that the Church would have been the first to become an ally of the unrest and the leader of those asking for substantial reforms in political governance, leading to a democratic transition. But the moderate opposition never really had a chance, despite the best of intentions. As a result, hence as Christian leaders in Syria are appealing for reconciliation and peace and openness, radical Muslim factions are calling for jihad and exclusion, a kind of apartheid for all non-Muslims. For decades Syrian Christians lived peacefully in a society alongside a Muslim majority which was tolerant. There was a cordial atmosphere of mutual acceptance and friendship. This is no longer the case. Syrian Christians are disoriented by the implosion of a way of life that was once quiet and safe. They are afraid to leave their houses, they avoid going out of their cities or villages, or do so only to move to other regions where they hope to find a safe refuge. In dangerous zones like Aleppo and villages close to Turkey, what terrorizes the population more than the fighting and the bombing, are the kidnappings, the snipers, car-bombs, the shelling and the looting … all this culminating in the manifestation of ISIS. Christians are victims of a war of destruction led by a certain foreign elements taking advantage of unrest. They have promoted a brother versus brother war. They have injected arms, money and tens of thousands of fighters, jihadists, fundamentalists, foreigners and mercenaries, recruited from many different countries. I do not know whether or not Aleppo has yet been designated as a “disaster zone” by international powers. But what I do know is that Aleppo is truly a disaster zone: a human disaster zone, a material and economic disaster zone. The citizens of this great and beautiful city, with its 7000 years of history, find themselves after four years of senseless war in a desperate situation. The prosperity which Aleppo enjoyed and which placed her among the most important cities of this region is lost. Innumerable attacks—most recently the bombing of the Christian quarter over Easter weekend—have destroyed its churches, its factories and its flourishing industry, its infrastructure and social and administrative institutions, its commercial area and its legendary souks, its ancient homes, schools, and hospitals. The result: Syria has lost one of its main sources of economic growth. Then there are the countless frustrations which the people of Aleppo have had to endure because of the siege, particularly shortages of food and other essential supplies. In a word, my flock has suffered and has been the innocent target of a war that is unjust and devastating. Since 2011, more than one-third of Aleppo’s Christians—some 40,000 people at least—have left the city. They are among the 3 million Syrians (both Christians and Muslims) who have fled to Lebanon, Jordan and Turkey; or they have joined the nameless ranks—6.5 million strong—of Syrians displaced in their own country. Since the beginning of this senseless war, the Church—while encouraging the regime to enact the reforms desired by the majority of citizens—has called for an end to armed conflict and has called for negotiations to achieve a political solution to this crisis. The Assembly of Bishops of my country, along with the Pope, has not ceased to call believers to prayer, the fighters to lay down their arms, and nations to cease military interference. Of course, we are grateful that a large coalition of nations is committed to stopping ISIS. I hope and pray that this fight will be won; nevertheless, at the present time, in both Syria and Iraq, Christian communities—along with other vulnerable minorities—are defenseless against ISIS assaults, especially when they are the prime target of the “caliphate’s” religious cleansing campaign. If these defenseless people are to survive, the US and its allies must provide better protection and execute a more aggressive strategy. Church leaders in the region have welcomed the Vatican’s call for an appropriate military response to ISIS and other extremist groups threatening Christians and other vulnerable minorities—in accord with Pope Francis’ insistence that the use of force is “legitimate [when used]… to stop an unjust aggressor.” The Episcopal Conference of the Bishops in Syria, in plenary session last March, issued an appeal to all nations to stop supporting the terrorists in any way and to ensure special protection for Christians so that they may be safe and continue to live in peace in their own country. Across the region, as the fight is taken up against ISIS, the US and its allies must be aware that Christians and other minorities are often caught up in the fighting, facing calamities as they are displaced, without any provisions for shelter, food, and medical assistance. The emergency needs of vulnerable populations must be seriously considered. 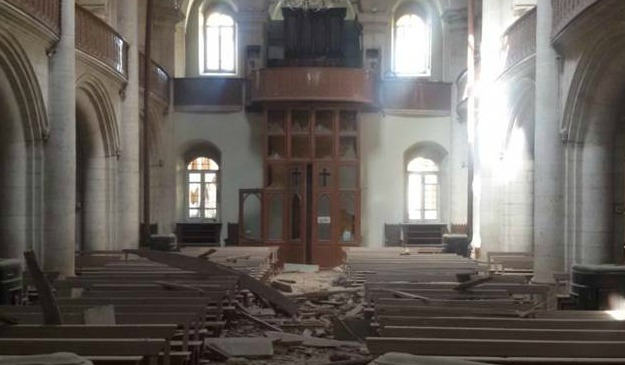 Just recently, disaster struck the peaceful and quiet population of the city of Idlebin northern Syria, where Christians have been executed by ISIS, many people have been displaced and the parish priest Father Ibrahim Farah has been kidnapped. And then there was the April 19 release of a video showing ISIS slaughtering 30 Ethiopian Christians in Libya. Once—God-willing—ISIS is defeated and a measure of peace is restored to the lands, Christians must be able to count on the US and its allies for continued, long-term military protection. There has to be a kind of iron-clad system in place so that the tragedies of the past four years are not repeated. To ensure political stability, it is essential that Christian leaders, both lay and religious, are given a voice and presence at the negotiating table. Christians bring forth a vision—inspired by democratic and humanistic values; they can act as bridge-builders between Shiites and Sunnis, and they can help develop a political system that ensures the rights of all citizens. Last but not least, Christians—like other people whose lives have been overturned by years of fighting—need practical, financial help to rebuild their lives, especially their professional lives. If Christians are not given the means to earn a living, there is no way they can remain in Syria or Iraq. The hierarchy’s lamenting of mass emigration can do little good if the Churches do not give their flock concrete means to rebuild their lives. Christians in Syria need to feel secure and they want to know that they will not be left alone in the days and years to come. That is why I am calling for the creation of “Build to Stay,” a Christian social initiative that needs to be supported by a “Solidarity Fund.” This fund will allow workers—carpenters, plumbers, teachers, lawyers, craftsmen and others—to re-establish themselves professionally, to buy the equipment and supplies they need to get started again; to rebuild the city of Aleppo and their own lives. However, if the war continues and if peace is not restored in the streets and in our hearts, all hopes may be lost, for all Syrians, Christians and Muslims alike. It is my fervent prayer that my fellow bishops in the US and around the world—they, too, successors of the apostles—join me in accepting this shared responsibility and making the fate of the persecuted Christians in the Middle East a real priority, and not treating it merely as one cause among many. That is because the suffering of my people is a wound to the entire Body of Christ. We know the task is difficult but we Christians also know that He in whom we have put our trust is faithful and never abandons His own—He who came to stay with His own, will never leave them to fend for themselves. Jean-Clément Jeanbart is the Melkite Greek Catholic Archbishop of Aleppo, Syria. He was speaking at the Edward Cardinal Egan Catholic Center at New York University, New York City, in April. This article is published by Jean-Clément Jeanbart and MercatorNet.com under a Creative Commons licence. You may republish it or translate it free of charge with attribution for non-commercial purposes following these guidelines. If you teach at a university we ask that your department make a donation. Commercial media must contact us for permission and fees. Some articles on this site are published under different terms.